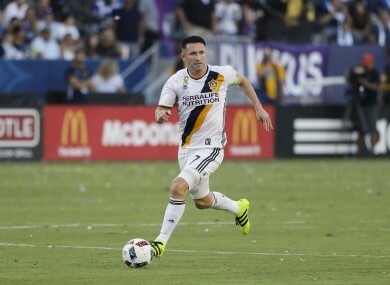 Robbie Keane in action for LA Galaxy. SPECULATION MAY BE mounting that Robbie Keane’s time at LA Galaxy is up but the Dubliner has pledged that a departure from the club won’t end his MLS spell or his football career altogether. Keane and Steven Gerrard started on the bench for last night’s penalty shootout playoff defeat to Kevin Doyle’s Colorado Rapids and it is believed that the pair’s time at the club has come to an end. The out-of-contract striker was quick to dismiss talk that he would hang up his boots, insisting immediately after the Rapids clash that he would be playing in the league next year, even if that meant he had to switch clubs. “I’ll be playing next year, somewhere,” Keane said after last night’s loss. Keane joined the Los Angeles club in 2011 from Tottenham and he has become one of the success stories of the league, having won the MLS Cup three times. The 36-year-old has been struggling with fitness issues in recent times and didn’t take a penalty in last night’s shootout due to a groin injury sustained following his introduction as a substitute. The Galaxy futures of manager Bruce Arena and MLS legend Landon Donovan also remain up in the air. Email “Robbie Keane vows to continue MLS career even if he has to leave Galaxy”. Feedback on “Robbie Keane vows to continue MLS career even if he has to leave Galaxy”.